"The Whites, by law of conquest, by justice of civilization, are masters of the American continent, and the best safety of the frontier settlements will be secured by the total annihilation of the few remaining Indians. Why not annihilation? Their glory has fled, their spirit broken, their manhood effaced; better that they die than live the miserable wretches that they are." L. Frank Baum advocating genocide, December 20th, 1890. It is August 25th, 1939. As Hitler masses his troops on the Polish border, Judy Garland skips down the Yellow Brick Road for the first time. By the time The Wizard of Oz is on wide release Hitler will have sparked World War II, fascist ideology plunging the world into a confrontation that will leave millions dead. In a sick parallel Baum's twin dreams come to life simultaneously, Oz is realised on the silver screen at precisely the same moment as his fantasy of racial extermination is enacted with brutal efficiency in the Nazi death camps. And so to Wicked, the musical adaptation of Gregory Maguire's 1995 book; a secret history of the events of The Wizard of Oz, casting Elphaba, the Wicked Witch of the West as a revolutionary radical battling against the fascism of the Wizard of Oz, discrimination against talking animals standing in for anti-semitism (a faint echo of Art Spiegelman's Maus). As Dorothy pulls back the curtain to expose the all-too-human Wizard, so the musical pulls back the curtain to expose the true story of The Wizard of Oz: manipulation, murder, political intrigue and the intense power of propaganda. As a show this is a fantastic night out, expertly performed with clockwork precision. 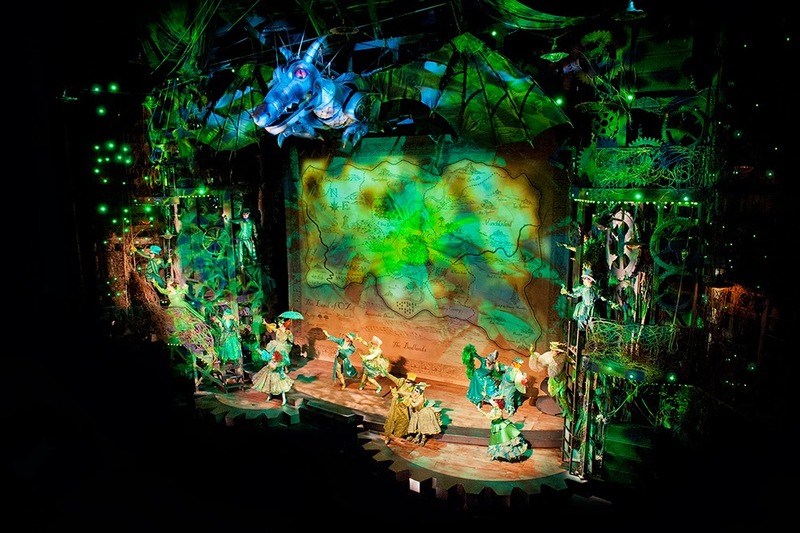 Hundreds of elements: from the orchestra, to the set and costume design to the outrageously talented cast all synchronise into something that easily ranks in the highest echelons of West End productions. Considering that Wicked has been playing to packed houses for 7 years in the Apollo Victoria, and is taking bookings up to 2014 it's not surprisingly that everything is polished to a machine-like precision. I'd argue that reviewing Wicked is a bit of a fool's errand; it seems to universally loved and highly regarded. But underneath all this big-budget West End spectacle it's the politics that appealed to me the most. Elphaba depicted as an authentic revolutionary hero, fighting not only explicit fascism but also ineffective liberals who'd sooner look the other way than stand up against evil. 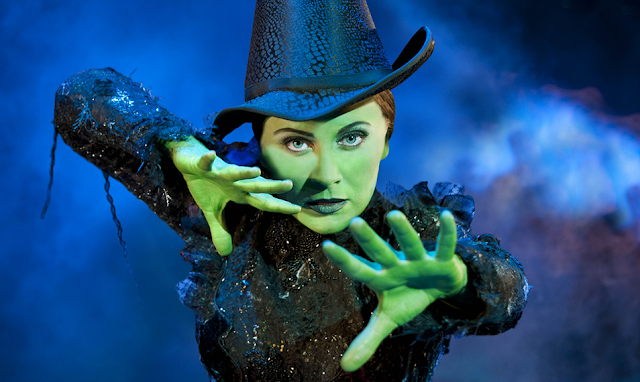 A noted philosopher once said "it's not easy being green" and I'm sure Elphaba would sympathise. Elphaba's greenness initially appears to be a blunt metaphor for racism yet as the plot develops we realise that it's more complex: a visual symbol of how a strong conscience and tendency to non-conformism irrevocably defines a person as separate from wider society. Elphaba always behaves in an instinctively conscientious way: the key scene being where she's disgusted and saddened by the fascist graffiti mocking her professor, Dr Dillamond. Acting without a second thought she sides with him against her cowardly classmates. As she gains power within the narrative she uses her it commit violent revolutionary acts in Oz, releasing political prisoners and those discriminated against in as a kind of one-Witch Red Army Faction. In Wicked the Wizard of Oz is presented as straightforwardly fascist, explaining in simple terms his plan to unite Oz in hatred of the talking animal untermensch. The creation of an 'other', a nebulous target upon which the populace can project their hatred is essential to fascism. Oz's tactic here is directly inspired by the Nazi persecution of Jews, but sadly this is far from a uniquely Nazi idea. The globe is dotted with governments who'd would rather their citizens blame the vulnerable for their problems: for a close to home example see the British government's scapegoating of those on benefits as 'scroungers'. 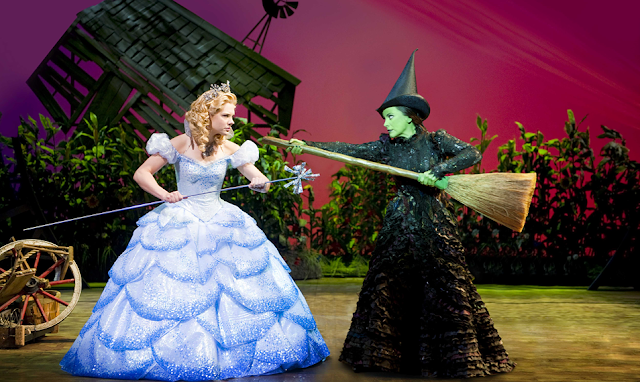 Though Oz as fascist manipulator is an interesting concept, Wicked focuses more on the contrast between the truly revolutionary Elphaba, and the quisling liberalness of Glinda, the 'good' witch. Glinda is a moral abyss; a person that recognises the evil surrounding her in society yet does not upset the applecart for the sake of 'keeping up appearances'. We see her vacuousness exposed with crystal clarity, her knowledge of corruption making her acquiescence to it that much more despicable. She only understands how stupid she's been in the finale when she realises that her inaction has resulted in multiple tragic deaths. Similarly complex is the love interest Fiyero, who finds himself torn between preserving the status quo as an appendage of Glinda, and pursuing justice as an equal partner with Elphaba. His relationship with Elphaba is unambiguously shown as true love - recalling Marguerite Duras' diktat that the only way to have a truly fulfilling romantic relationship is not for a couple to stare into each other's eyes and shut out the world around them, but to join hands and actively engage with a joint external cause. Elphaba and Fiyero are united by joint acts of conscience - their identical willingness to place themselves in opposition to societal norms. With Elphaba painted as ideal revolutionary, it's perhaps a little disappointing that *spoilers* she ends up surviving her famous 'death' at the hands of Dorothy (but hey, this is a popular musical and I can't begrudge a happy ending). 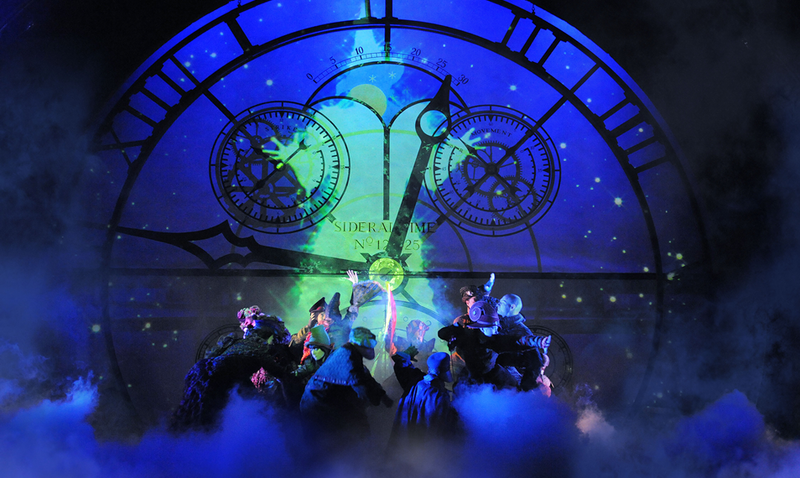 Wicked begins with Elphaba's death, the bulk of the story then told in flashback. As the musical plays with the tropes of Oz, we see her death gradually getting closer and closer, the appearance of Dorothy's house a Halley's Comet-like portent of doom. We all know how this story ends, and we recognise in Elphaba the romantic figure of the martyred revolutionary. So, appropriately her 'death' is the catalyst for a real shift in Oz society; Elphaba only able to accomplish as a symbol what she most desired as a person. So basically she's Che Guelphaba. Boom boom. By the end of the play we've seen a stunning artistic and technical achievement, coupled together with some fiery revolutionary rhetoric. The 'ghost' of Baum's call for genocide has been tackled head on and definitively exorcised - grubby calls for exposed as monstrosity. The audience has been given an abject lesson in the danger of woolly liberal 'oh dearism'; that tolerating and ignoring injustice is as much a crime as perpetuating it. But front and centre we see the heroic sacrifices the ideal revolutionary must make: friends, family, social position, reputation and eventually life. Only someone that a corrupt society regards as 'wicked' can pursue true justice. As in Oz, so below. Wicked is at the Apollo Victoria, probably forever, and quite rightfully so. Tickets here.